The candidates for Florida governor decried extreme political divisiveness on a day when pipe bombs were mailed to Democratic leaders, but then they immediately began intense name-calling during their final debate Wednesday. "I know firsthand that when we start going down that road, it can be very, very deadly," DeSantis said. "It is important that we try to unify." "We've really seen the collapsing of political discourse," Gillum said. 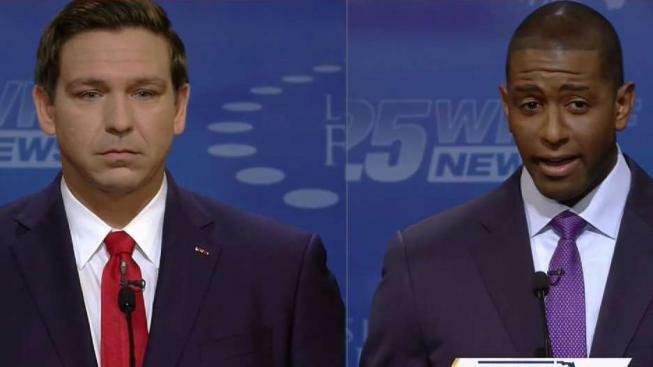 That's when the discourse between DeSantis and Gillum turned nasty. Gillum, who is seeking to become the state's first black governor, mentioned that DeSantis said the day after the primary that Florida voters shouldn't "monkey this up" by supporting Gillum. And Gillum added that DeSantis was endorsed by President Donald Trump. "My opponent ... has run this race very, very close to the Trump handbook, where we call each other names, where we run false advertisements,"
Gillum then called DeSantis a liar, and DeSantis called Gillum corrupt, pointing at Broadway tickets to "Hamilton" that were supplied by an undercover FBI agent investigating corruption at Tallahassee City Hall. Gillum admitted taking the ticket but said he received it from his brother and he thought his brother swapped them for concert tickets. "I should have asked more questions to make sure that everything that transpired was above board," Gillum said, before quickly trying to switch topics. "In the state of Florida, we've got a lot of issues. In fact, we've got 99 issues and Hamilton ain't one of them." Gillum said he isn't a subject of the FBI probe. DeSantis wouldn't let it go, mentioning the Broadway tickets several times. "He wants you to believe that he's not under investigation," he said. "Why would an undercover FBI agent posing as a contractor give him a $1,000 ticket to 'Hamilton?'" "How the hell am I supposed to know every single statement somebody makes?" DeSantis said, his voice rising. "I am not going to bow down to the altar of political correctness." Gillum responded, "My grandmother used to say a hit dog will holler, and it hollered through this room." DeSantis reiterated he would have vetoed a bill signed by Republican Gov. Rick Scott three weeks after February's massacre at Marjory Stoneman Douglas High School that raised the age limit to buy a rifle from 18 to 21 and imposed a three-day waiting period on rifle purchases. "The way to keep our communities safe is to work with law enforcement, not against law enforcement, and you need to identify those individuals who should not have access to firearms," he said. "If you want to own the power of God at your waist belt, you should have a background check. If you are a domestic violence abuser, convicted, you should not have a gun where you could snuff out the lives of your loved ones," Gillum said. "All we're simply saying is that they can keep $5.3 billion but we deserve a billion of that to come into this state" for education, he said. DeSantis replied, "Businesses will leave the state, people will lose jobs and we'll stop people from investing in Florida. It will be a historic mistake." "If we do that, we will pull down $6 billion from the federal government that will go into this state's health care system, so we can hire more doctors, more nurses, more nurse practitioners," Gillum said. "Some people were paying more for premiums than for rent, so people couldn't afford it. Some people lost access," DeSantis said. "Andrew supports a single-payer plan which will force people off Medicare, force people off their employer plans and put them on a government-run single-payer plan that is wrong."